Market capitalisation or market cap is the market value of a company's issued share capital – in other words. the number of shares multiplied by the current price of those shares on the stock market. Companies are ranked as large-cap, mid-cap and small-cap depending on their market capitalisation (market cap), though the actual criteria for classification depend on the market concerned. 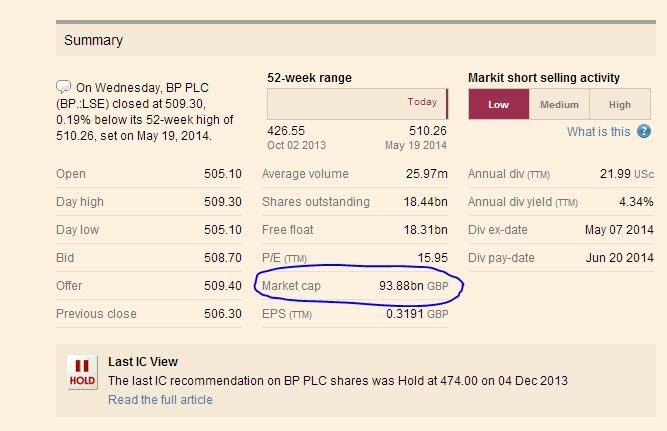 It is possible to view the market cap of a listed company by clicking on the hyperlinked company name as it appears in a story on the FT website. Or you can visit the FT's markets data section. In May 2014, an FT report said "Modi mania" had propelled India into the world's 10 biggest stock markets by value, surpassing Australia. Total market cap of Indian companies was found to have jumped 25 per cent in dollar terms since the beginning of the year.